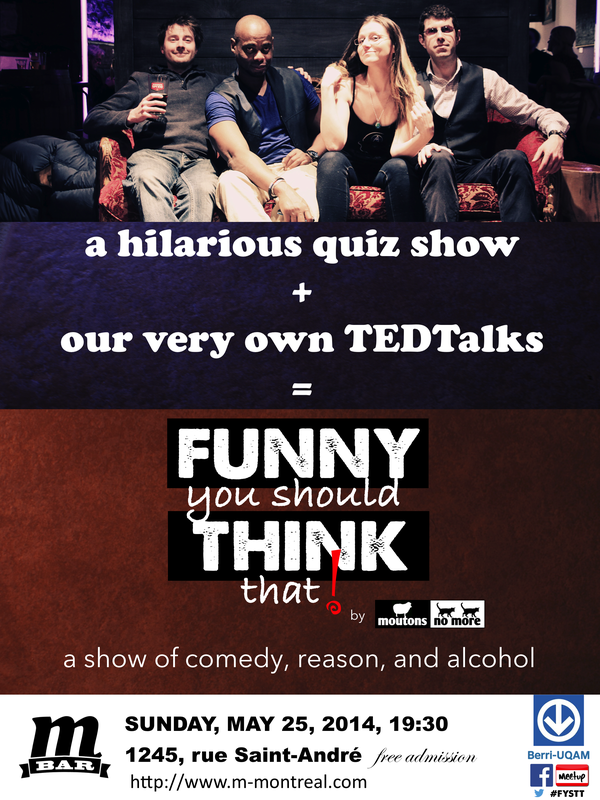 A show of comedy, reason, and alcohol. FUNNY YOU SHOULD THINK THAT is a monthly event (intelligently) designed to make you laugh and think. Moutons No More takes to the stage with amazing guests to talk pseudoscience, lambast religion, and get you to think more critically. It’s like the Rolls Royce of Skeptics in the Pub and just what Montreal need. Come for the show; stay for the conversation. This month, we bring you a quiz show with stellar panelists and prizes to be won, as well as our own version of TEDTalks, with three rationalists taking to the stage and sharing their ideas. Special guests: comedians Jon Selig and JP the Apostate, Matt Barbacki, and David Kaldahl!